Blue butterflies browse brilliant blossoms in a sunny Peruvian meadow. 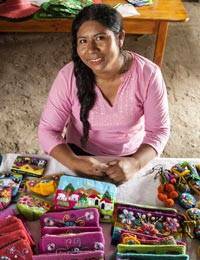 By Balvina Huaytalla, this handcrafted coin purse showcases the traditional Andean art of arpillería. Each tiny figure is crafted in three dimensions and embroidered by hand. The reverse side is solid black cotton.